Prior to the release of the Curse of Naxxramas adventure, there were 382 different cards that players could obtain and use to build new decks. 382 is a big number, and given that the maximum deck size is 30 cards, it is always a struggle to choose which cards you can fit in your deck. There are so many excellent minions that cost two mana, for instance - how do you decide which ones to include? This conundrum has become even worse with the new adventure, since the number of available cards now sits (or will sit) at 412. And, to make matters worse, almost all of the thirty new cards seem viable – there are no obviously bad cards. 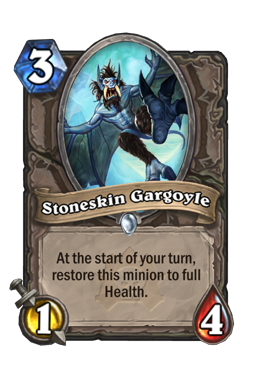 Even though some of them appear more situational, like the stoneskin gargoyle , every card that I’ve used so far has seemed excellent in a certain deck and with the right environment. So now that we have even more excellent cards to use, how do we possibly choose which ones make the cut and which ones stay in the binder? Normally, it would be easy enough to simply look at how valuable each card is and make a decision based on that. As a matter of fact, there are several articles on this site (including my own) which talk about card value in detail and how to pick cards based on their stats. With all of the new cards, though, value becomes a little less useful as a point of discussion, because so many of the cards are incredibly valuable, at least on a theoretical level. 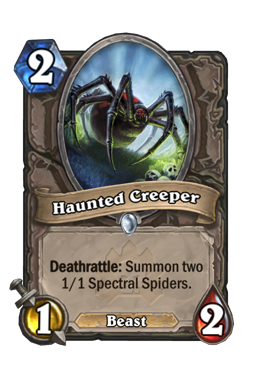 The haunted creeper technically has 3 attack and 4 health for 2 mana, which means it almost beats the vanilla test twice. 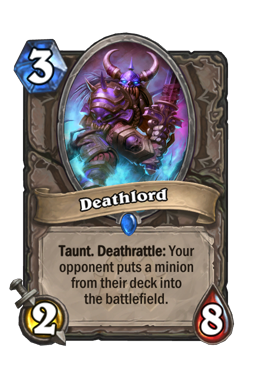 The Deathlord has a whopping 10 stats for only 3 mana. These cards, and others like them, have made it more difficult to understand how valuable a card is by sheer numbers alone. Today, I want to show you a different way of thinking about which cards to put into your new deck and which to exclude: rather than thinking about what a card is, the trick is in understanding what it is not. I’ve introduced a lot of new players to Hearthstone, and it’s always interesting to me how they learn which cards are ‘good’ and which are ‘bad’. 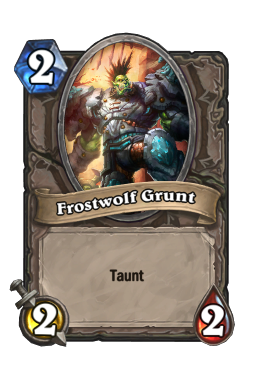 Every single player I’ve seen go from absolute beginner to a competent player (myself included) has at one time used cards like the frostwolf grunt , or even the much-maligned goldshire footman . A lot of the time, new players think these cards are great – after all, their stats aren’t bad, and they screw up the enemy’s first few turns because they are forced to trade minions that they otherwise wouldn’t have. Right? It’s true that the stat distribution isn’t bad for these cards, and they do sometimes force annoying trades when played early enough in the game. But what these newer players fail to recognize, and indeed, what more experienced players unconsciously know, is that the cards themselves are a resource. You only get 30 different card slots to build a deck with, and because of this, each of those slots is exceptionally valuable. When you choose a card to go in your deck, you often think about its stats, its value, and its synergy with the rest of your deck. What you should also be thinking about, though, is that the card you choose is taking up a slot, and thereby preventing any other card from occupying that slot. 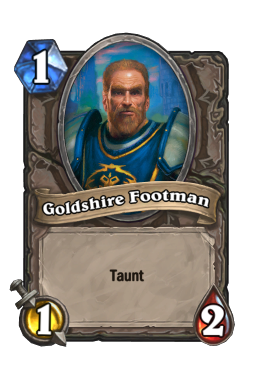 So, if you were to choose a goldshire footman as the 1-drop for your deck, it is also preventing you from including, say, the argent squire or the leper gnome . Why? 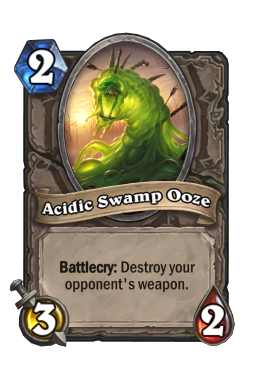 Because in order to create a nice, balanced curve, most decks can only really include a certain number of 1 or 2 mana drops. The standard token druid, for instance, has two argent squires in it to help with early game tempo. 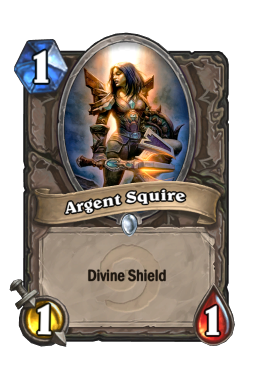 If you wanted to add the goldshire footman to the token deck, you would almost certainly have to take out the argent squire s, because the deck becomes much more awkward with 4 1-drops instead of 2. 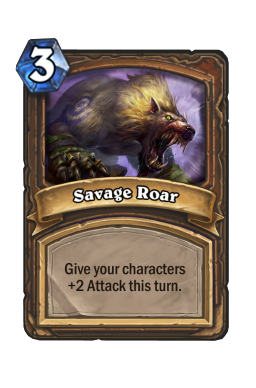 Even if you decided you would take out, say, a savage roar and a harvest golem instead of the squires to fit them in, the curve would be strange and ineffective as a result. So, not only are the cards in the game competing for the limited 30 slots you have to build a deck – they’re also competing for a much smaller number of spots given according to their mana cost, which varies depending on the type of deck. 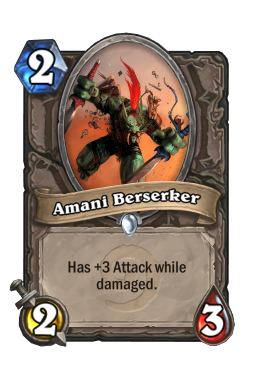 With an aggressive deck, you will have more flexibility in the 1-3 mana range than a control deck, because you will likely have room in your curve for many more of them. If you have 3 different 2-drop minions, it becomes much easier to decide which ones should be included. 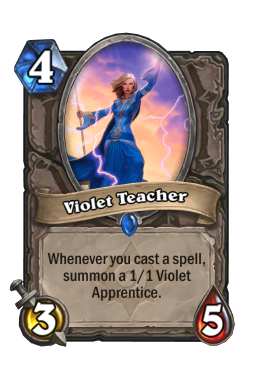 The same goes for control – they will have more flexibility in the 4+ mana range, because most of their cards will be in that area. No matter what, though, you will ultimately have to whittle down a very large corpus of valuable cards into just a few slots. That means that when you pick a card for your deck, what you are really saying is that it is the best possible card out of all of the cards that could fit into that slot. It’s hard to make a case for the goldshire footman or the frostwolf grunt being better than all other 1 or 2 drops in most decks, and that’s why you very rarely see them in constructed. Now that the theory is out of the way, I want to apply it. In this section, I want to look briefly at several of the more popular new cards and consider them in a negative way – that is, looking not at what you gain by putting them in the deck, but rather what you lose. 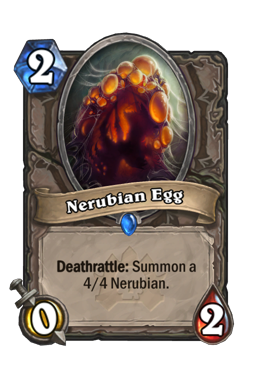 Let’s first look at probably the most popular card in the whole adventure so far: the nerubian egg . 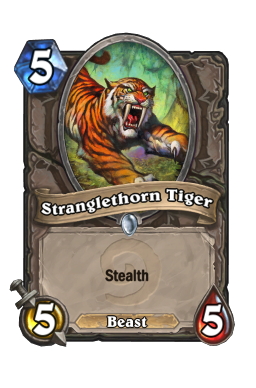 This card has come into warlock zoo decks quite naturally, but also into basically any deck that has a means by which to activate its effect. Druids can use it very well, as can paladins, priests, warriors, and rogues. If you can buff the Egg to have some attack and trade it, you can get a 4/4 out of it in addition to potentially clearing an enemy minion with the buffed Egg. Seems like something that anyone would automatically include in their deck, right? If you start to think about what you lose by including it, you might start to think differently. Think about the zoo for a moment. 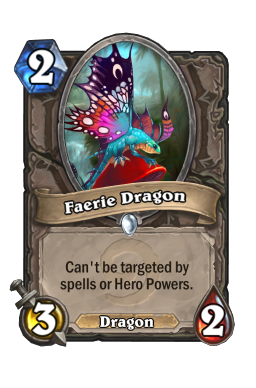 If you’re going to include the Eggs, it means you are not going to include another 2-drop that you might have otherwise included, like a faerie dragon or an amani berserker . That means that for every turn you have the egg sitting on the table, you could have been doing 2-3 damage to the opponent instead, or trading for their minions. Yes, you’ll get a 4/4 at the end, if the Egg isn’t silenced, but is that worth losing 3 damage a turn over several turns? If you think about the Egg as occupying a 2-drop slot instead of just on its own, it becomes a much harder decision to include it in a board-focused deck like the zoo. 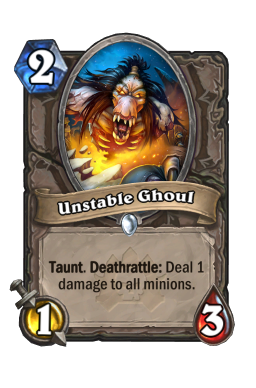 This same logic goes for the new card this week, the unstable ghoul . Yes, it’s a good card against aggro – being a taunt, it forces people to attack it and damage everything – but if you include the ghoul, you probably won’t have room to include a wild pyromancer , which is a similar card that fits a similar role. The wild pyromancer has one more stat point, and it is distributed in an effective way for trading up or putting on early pressure. Although it is more vulnerable than the ghoul, and indeed, has more of a chance to be killed without inflicting its damage to the board, it is also more useful in a non-aggro matchup. Does this mean that you should always pick the wild pyromancer over the unstable ghoul ? Absolutely not. What it does mean, though, is that you should understand not only what you gain from including a card, but also what you lose. Will putting in a strong anti-aggro card like the ghoul hurt your control matchups? 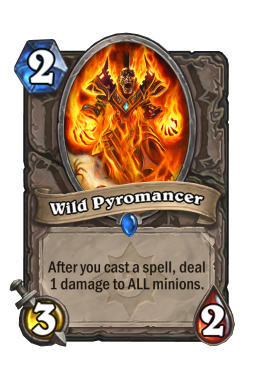 Alternately, will a more well-rounded card like the wild pyromancer be as consistently good against your aggro matchups? These are the sorts of questions you should ask yourself. In both of the above examples, I’ve shown you how a card becomes somewhat less desirable when you use negative comparison, but there are certainly instances where it can help to show just how valuable a card is, too. Another new card this week, the sludge belcher , is certainly one of them. 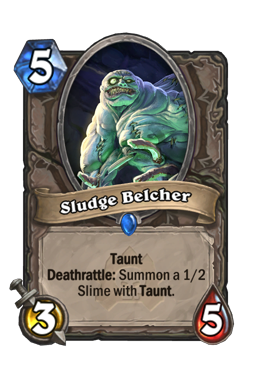 The sludge belcher is a 5 mana 3/5 taunt that spawns an additional 1/2 taunt after it dies. 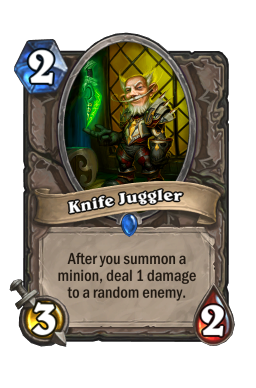 You can think of this as putting a senjin shieldmasta and a goldshire footman together into one card. 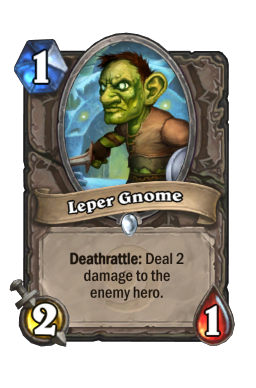 By including this card, a 5 mana taunt, you are almost certainly choosing to not include a fen creeper , and potentially not a senjin shieldmasta either. What do you gain? 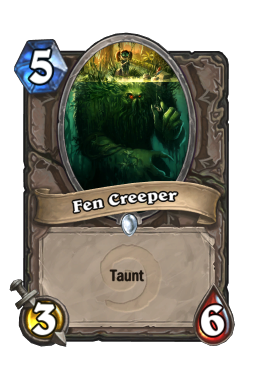 Well, as compared to the fen creeper , you lose one health for the benefit of spawning an additional 1/2 taunt. To me, that’s a simple decision – the 1/2 taunt is just a better deal. As compared to the senjin shieldmasta, you’re paying an additional mana for the same stats, but also getting another creature for it. In my eyes, both of these ‘sacrifices’ are not especially tough to make; the sludge belcher has great value, and when you compare it to the other options for a midgame taunt minion, it just shines even brighter. Comparing cards in this negative way is hardly an exact science, particularly at the low-mana end of the spectrum. I’ve made some fairly specific comparisons here, but you can be much more general yourself. 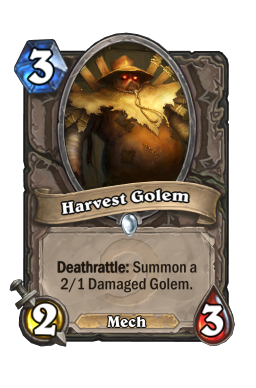 For instance, if you’re thinking about any minion for 3 mana, ask yourself whether you would rather have that minion or a harvest golem . 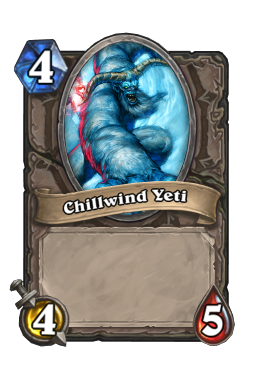 If you’re thinking about 4 mana, ask the same question, but with a chillwind yeti . 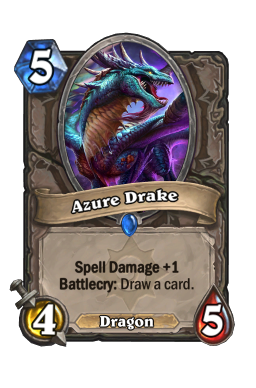 5 mana is harder, but you might think about an azure drake or even a stranglethorn tiger . 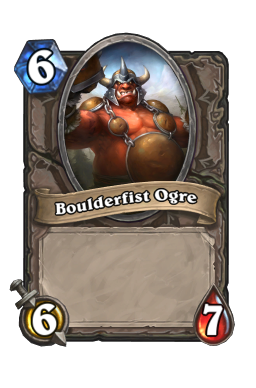 For 6 mana, it’s the boulderfist ogre , and beyond that, you have to start comparing individuals. All of these are generally high-value cards that can fit into a lot of different decks, and if the minion you’re looking at isn’t as useful as one of them for the specific deck you’re building, you may want to think twice about including it.